Peace. I struggled even to watch the TV series – I’m not sure why. It is not so much the tome-sized tome , the style of address or the massive cast of characters. It is more an oppressive sense of doom – the doomed world of the Russian aristocracy already in self-destruct from Page 1. The same with Anna Karenina – the train has in a manner of speaking already left the station. 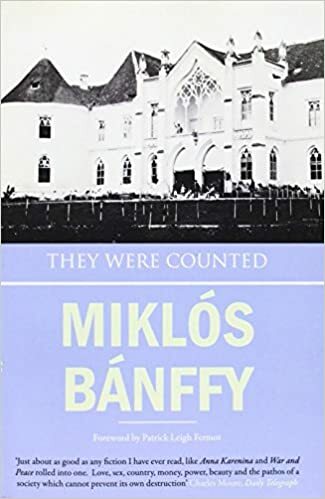 I had none of this difficulty however with the hugely readable trilogy The Writing on the Wall by Miklós Bánffy, despite comparisons with Tolstoy being inevitable. These books too operate within the twilight of an empire – although this time the Austro-Hungarian empire in the decade leading up to the first world war. Like Tolstoy the author is part of the fabric of the vanishing aristocracy. There is a love story but it is more a love story to a fading landscape and history, than to any particular woman. The main character, based on Bánffy himself, spends his time riding from baroque castle to baroque castle, attending balls (which never seem to end before 7 in the morning – what did these people do for sleep) parties and race meetings. Duels are fought over comments considerably less offensive than any trawl of twitter would produce on a given day. Traces of great empires are hard to extinguish – we no longer have a great empire and by ‘we’ I mean anyone on the planet – but we do have societies, environments and a lot left to lose. Strange how you can see the impending destruction of a society only with the benefit of hindsight. Or perhaps it is less a lack of seeing than knowing what to do, pressed as we are to the front of that speeding train , we elect leaders who sometimes mean well and sometimes don’t. Then sit back and wait for something right to happen. Should we be surprised if it doesn’t? Take away the baroque castles and we all ride those plains on borrowed horses.